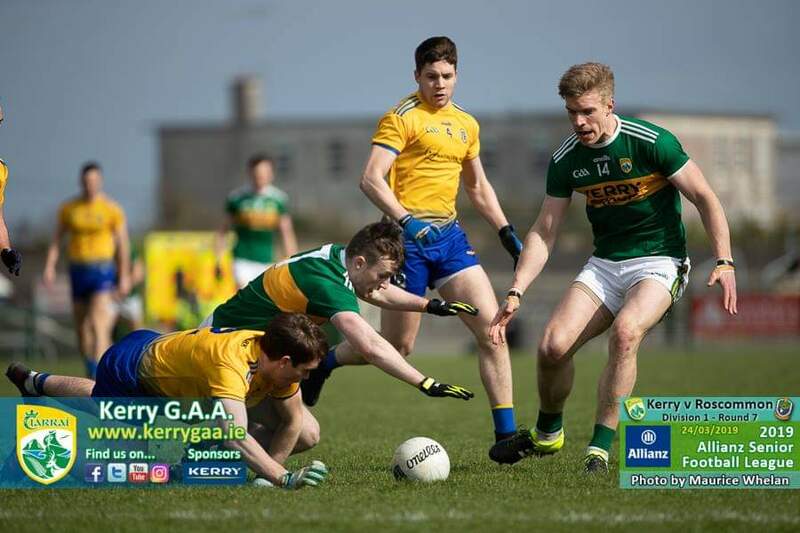 Kerry comfortably reached this year’s Division One final, sweeping aside Roscommon with an impressive attacking display at Dr. Hyde Park. David Clifford marked his first start of the year with 0-5, while ace marksman Seán O’Shea pitched in with 1-5 over the 70 minutes to erect a match-winning platform for Peter Keane’s charges. Roscommon battled bravely early on but once O’Shea pounced for a 28th minute goal, the Kingdom were on their way. With Clifford and Tommy Walsh proving to be a handful for the Roscommon defence, the visitors eventually made their superiority count. Roscommon had started brightly, as early points from Niall Kilroy, Conor Cox (free) and Cathal Cregg settled them. But a score from Tom O’Sullivan was sandwiched between two efforts from play by Clifford to leave the sides deadlocked at 0-3 apiece after 16 minutes. The home side, with a strong wind at their backs, grabbed the next three scores from Donie Smith (a free), Ronan Daly and Shane Killoran to open up a three-point lead but two rapid fire Kerry scores from O’Shea (free) and the hard-working Stephen O’Brien pared the margin back to a point in the 26th minute before O’Shea ghosted in behind the Roscommon defence for a well-worked goal two minutes later. By the time half time rolled around, there were three points (1-8 to 0-8) between the sides courtesy of further points from O’Shea, Clifford and Dara Moynihan, while frees from Cox and Smith kept the Rossies in touch. At this stage, Roscommon had been reduced to 14 men with midfielder Tadhg O’Rourke in the sin bin. Roscommon boss Anthony Cunningham threw Enda Smith and Diarmuid Murtagh into the fray for the second half, but Kerry were always able to keep their opponents at arm’s length. In truth, Roscommon made too many basic errors and Kerry’s ability to move the ball swiftly towards Tommy Walsh, Clifford and O’Shea proved to be their trump card. When O’Brien bundled Kerry’s second goal over the line in the 46th minute, there was only going to be one winner. Scorers for Roscommon: Conor Cox 0-4 (4fs), Donie Smith (2fs), Diarmuid Murtagh (1f), Ronan Daly 0-2 each, Niall Kilroy, Cathal Cregg, Shane Killoran 0-1 each. KERRY: Shane Ryan; Peter Crowley, Jack Sherwood, Graham O’Sullivan; Gavin Crowley, Paul Murphy, Tom O’Sullivan; Jack Barry, Diarmuid O’Connor; Dara Moynihan, Seán O’Shea, Stephen O’Brien; David Clifford, Tommy Walsh, Kevin McCarthy. Subs: Killian Spillane for McCarthy (6), James O’Donoghue for Walsh (50), Jason Foley for Sherwood (52), Mark Griffin for Crowley (57), Conor Geaney for Clifford (65). ROSCOMMON: Colm Lavin; David Murray, Seán Mullooly, Conor Daly; Conor Hussey, Niall Daly, Ronan Daly; Tadhg O’Rourke, Shane Killoran; Niall Kilroy, Cathal Cregg, Ultan Harney; Donie Smith, Conor Cox, Aengus Lyons. Subs: Enda Smith for Lyons (HT), Diarmuid Murtagh for D Smith (46), Conor Devaney for Kilroy (48), Hubert Darcy for Cregg (57), Gary Patterson for N Daly (67).